Alexander Downer is the Australian Minister for Foreign Affairs, a position he has held since March 1996. He also served as the federal parliamentary leader of the Liberal Party of Australia from 1994-1995. 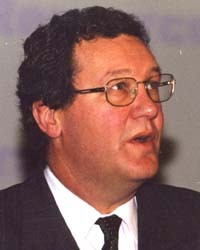 "Alexander Downer: Biography", accessed January 2007. "Alexander Downer", Wikipedia, accessed January 2007. Andrew McGarry and Geoff Elliott, "Hicks's state was judged by US flack", The Australian, January 20, 2007. Part of the material on this page is adapted from Wikipedia. This page was last edited on 10 August 2008, at 21:59.